By Rafael Nadal's exacting standards, his second-round victory at the U.S. Open was a success because he kept improving. He wasn't thrilled with his start, when he dropped two games in the first set. Then he lost one in the second and none in the third. The second-seeded Spaniard beat qualifier Rogerio Dutra Silva 6-2, 6-1, 6-0 in 92 minutes Thursday night. 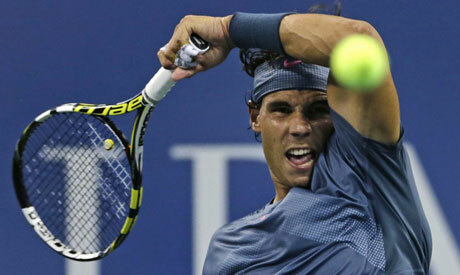 ''The result says that I did the right things,'' Nadal said. Through two matches at Flushing Meadows, he has looked like the player who has dominated on hard courts this year - not the guy upset in the first round of Wimbledon. And certainly not the one who missed seven months because of a left knee injury. ''When you are coming back after hard times, after an injury, after moments that you are not well ... you need to work with the right attitude every day,'' he said. ''You need to be ready to suffer, to enjoy the suffering, and to be able to change the situation. Serena Williams, Victoria Azarenka and Roger Federer also advanced with straight-set victories. Fourth-seeded Sara Errani crashed out Thursday in a 6-3, 6-1 loss to a fellow Italian, 83rd-ranked Flavia Pennetta. The 2012 French Open runner-up then fought back tears as she contemplated the pressure that built with her rise up the rankings. Victoria Duval, the 17-year-old American who upset 2011 champ Sam Stosur in the first round, reminded everybody that for now she's still a 296th-ranked qualifier. She lost 6-2, 6-3 to 30-year-old Daniela Hantuchova. The top-seeded Williams beat Galina Voskoboeva 6-3, 6-0, while No. 2-seeded Azarenka defeated Aleksandra Wozniak 6-3, 6-1. Other than one tumble onto her backside in the first set - Williams still got to the ball to win the point before toppling over - the defending champion was in control. Federer, seeded seventh, beat Carlos Berlocq 6-3, 6-2, 6-1 in 1 hour, 35 minutes. Fourth-seeded David Ferrer had to work a bit harder to oust Roberto Bautista Agut 6-3, 6-7 (5), 6-1, 6-2. Young Americans Christina McHale, Alison Riske and Jack Sock all advanced. John Isner, the top-seeded U.S. man at No. 13, needed nearly three hours to beat Gael Monfils 7-5, 6-2, 4-6, 7-6 (4). But No. 26-seeded Sam Querrey lost in four sets to Adrian Mannarino. The tournament's schedule got back on track after a rainy Wednesday that postponed eight women's matches. So Williams will be back on court Friday, facing Yaroslava Shvedova in the nightcap at Arthur Ashe Stadium. Former champs Novak Djokovic and Andy Murray also have matches, while two other U.S. Open winners, Juan Martin del Potro and Lleyton Hewitt, play each other. The revamped schedule Thursday meant that the day session ended after the night session - and nearly spilled into Friday. Also upside-down: the crowd at Louis Armstrong Stadium cheering for the acrobatic Frenchman, Monfils, against an American.